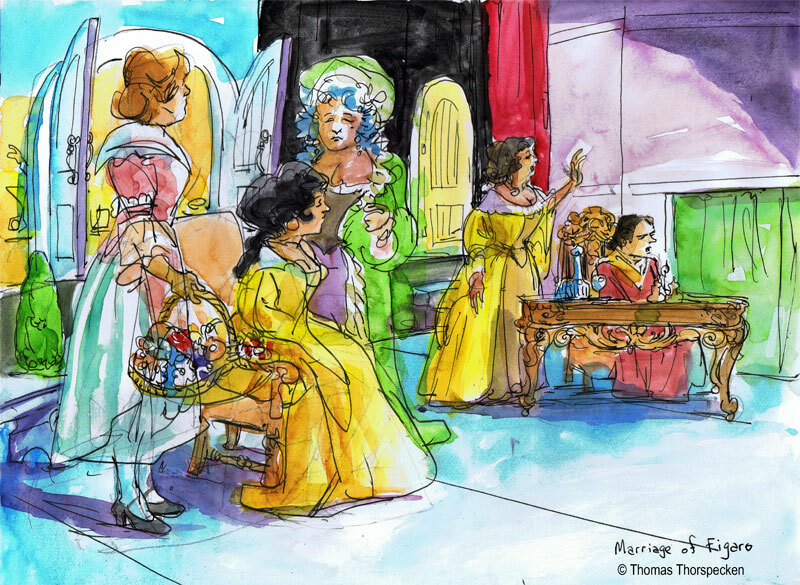 On election night, I went to a dress rehearsal for The Marriage of Figaro written by Wolfgang Amadeus Mozart. This Italian Opera premiered at the Burgtheater in Vienna on May 1st, 1786. When I entered the Bob Carr Theater, it was virtually empty and I sat in the second row and immediately started sketching the stage. The Orlando Philharmonic Orchestra was also on stage behind the limited set pieces. 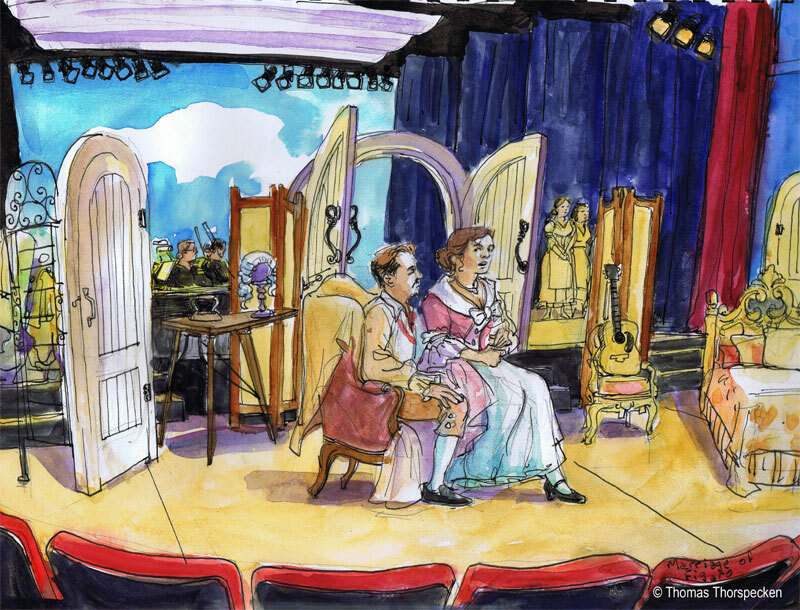 Soprano, Maureen O'Flynn, who played Susanna, walked on stage and arranged a wedding dress she placed on an arm chair. Baratone, Maurian Pop who was playing Count Almavia checked the set door to see how is swung open. Count Almavia was bored with his idyllic marriage to his Countess, played by Twyla Robinson, and he decides to exert his feudal privilege of droit de seigneur, the lord's right to enjoy the bride of his servant on their wedding night. His engaged servants, Figaro, played by Robert Gierlach, and Suzanna, as well as the Countess, object to his plan. 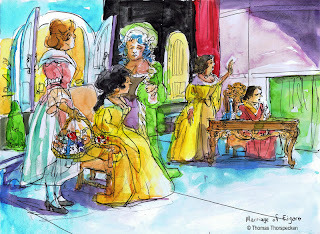 A comedy unfolds as the Countess, Figaro and Susanna make plans to dupe the Count. Identities are exchanged, oaths of undying love are pledged and even accomplices became confused in this "day of madness." I didn't understand a word that was sung and since I was sketching and I didn't have time to read the projected subtitles. Some things are so beautiful they don't need to be understood, just felt. The music is memorable and timeless. In the end there is forgiveness and absolution, every lover finds their mate. There is a performance Friday November 9th at 8PM and on Sunday November 11th at 2PM at the Bob Carr. Tickets run between $17 and $70.